The White House has changed its answering machine message to blame Donald Trump’s political opponents for its failure to answer calls. The US is in the middle of a government shutdown, leaving many federal services without staff. But callers to the White House comment line at the weekend were informed that Democrats were to blame. The recorded message says calls cannot be answered because Democrats are holding government funding “hostage”. 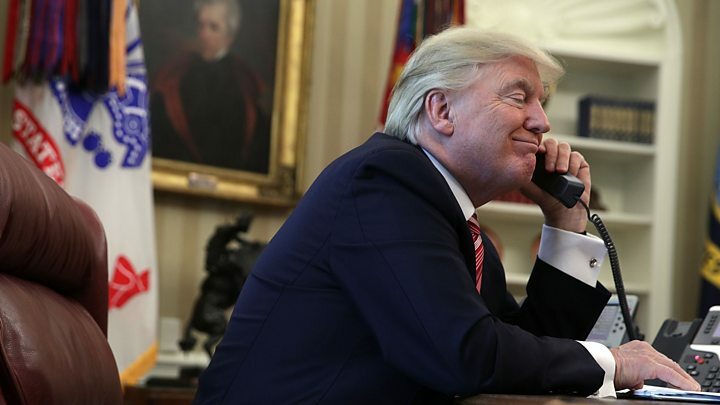 The recorded message was set up on the White House comment phone line, which accepts calls from members of the public. “Unfortunately, we cannot answer your call today because Congressional Democrats are holding government funding – including funding for our troops and other national security priorities – hostage to an unrelated immigration debate,” the recording says. Some members of the public opposed to Mr Trump expressed outrage at the partisan message on the public service. The message seemed so unusual to some that it was confirmed as genuine by fact-checking and urban legend-debunking website Snopes., in addition to dozens of journalists checking the recording for themselves. The line was frequently busy at the weekend, requiring multiple attempts before the BBC could get through to confirm the recording. The Public White House Phone Line spews partisan venom. The Vice-President just told troops in the field that Democrats are playing games with their pay. The Trump campaign is calling Democrats murderers. I think these people are trying to start an actual civil-war. The government shutdown began at midnight on Friday, when lawmakers failed to agree an extension to federal funding. Deep disagreements on funding for border security and immigration, along with military spending and the protection of undocumented immigrants who grew up in the US, led to the impasse. The US Senate has been in session throughout the weekend in an attempt to reach a compromise before the working week begins. If they do not, hundreds of thousands of federal employees be “furloughed” – on unpaid leave – until the impasse is resolved.